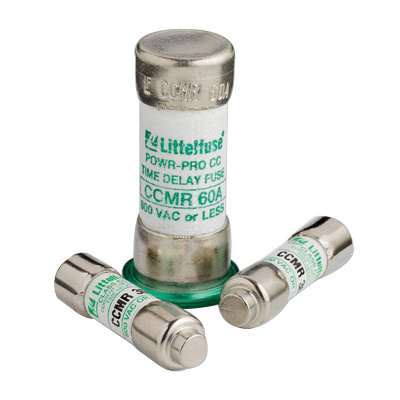 Littelfuse Powr-Gard™ CCMR Series Current-limiting time delay fuse has a voltage rating of 600/250-Volts AC/DC and current rating of 6-Amps. It has an interrupt rating of 200-Kilo-Amps at 600-Volts AC, 20-Kilo-Amps at 250-Volts DC and 300-Kilo-Amps at 600-Volts AC. This Class Midget CC, rejection, dual element fuse supports panel mounting. It measures 0.41-Inch Dia x 1.5-Inch. Cylindrical fuse is suitable for motor and motor branch circuit protection. Fuse meets 248-4, UL 2/10-30 A, E81895, 248, CSA LR29862 and RoHS standards.